default / unnamed slots: used when you have a single slot in a component. We create them by adding <slot> in the template where we want to be able to inject our content. This <slot> tag will be replaced with any content passed to the component’s template. named slots: used when you have multiple slots in a component and we want to inject different content in different places (slots). We create those by adding <slot> with a name attribute (e.g. <slot name="header"></slot>). Then when we render our component, we provide a slot content for each named slot by adding a slot attribute with the slot name. 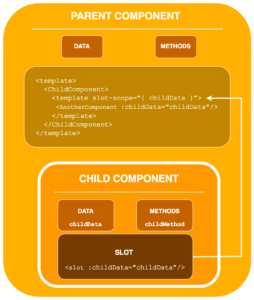 By doing that, the <slot> tags in the component will be replaced by content passed to the component.